IMCORP conducted its Factory Grade® assessment on a critical loop at a government nuclear facility in southeast USA. This particular PD occurred at a Y-joint located 185 ft. and had an inception voltage of Uo. PD activity at Uo suggests imminent failure and requires prompt action to avoid unplanned outages. 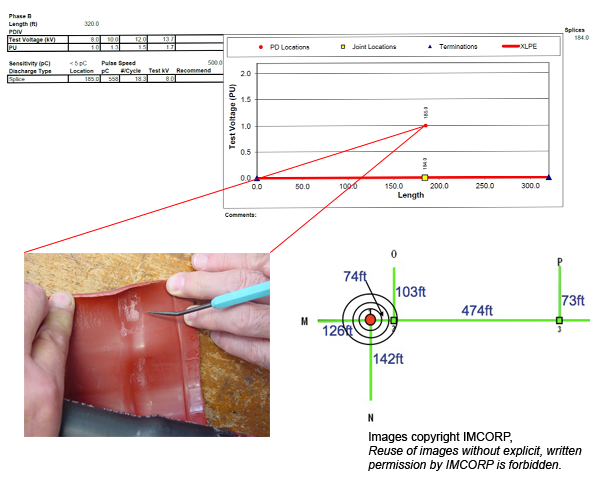 Inspection of the Y-joint showed evidence of an improperly installed heat shrink joint. The joint was not thoroughly heated during installation, creating a void between the layers. This void created the perfect environment for the development of PD activity. The above image shows the degraded white area affected by PD activity. Reportedly, withstand tests had been used in the past and had missed this defect. At a critical facility such as this, unplanned outages can be very costly. This situation demonstrates the value of the Factory Grade® assessment at sensitive facilities.